Mappa puffer are usually solitary and wary of divers. One day, however, guests of Miguel’s Diving found one that was too busy eating to care that divers approached for a rare, up-close encounter. Miguel’s Diving staff call this fish Mappa puffer because its scientific name is Arothron mappa. 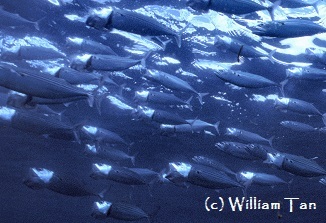 Other English names include Map puffer, Arothron puffer, Scribbled Arothron puffer and Scribbled puffer. Additionally, this fish can be called pufferfish or simply puffer. Sometimes, pufferfish are called toadfish. As a result, this introduces additional name variations. Mappa puffer live in tropical and subtropical oceans. Their distribution ranges from the Indian to western Pacific oceans. The key to distinguishing this species from other pufferfishes are the lines that radiate from its eyes. It can grow up to 65 cm in length. Also, pufferfishes like this species lack scales. Divers will see them during the day. This type of pufferfish eats about anything that does not move. It cannot swim fast because of its small fins. Hence, its diet mainly consists of sponges, algae, clams and even coral. 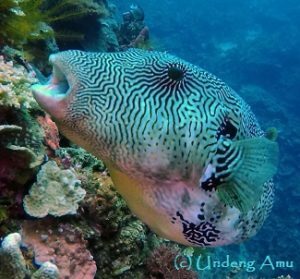 However, the Mappa puffer recently encountered in Gorontalo repeated selected something surprising to crunch. Watch the video to see! This feeding behavior raises questions. 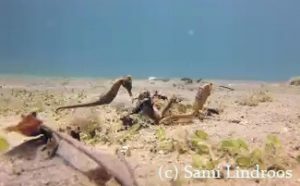 Why is it eating dead coral? How can such a soft fish crunch hard coral to bits? The answer perhaps lies inside the mouth of Mappa puffer. It has four strong teeth that keep growing. As a result, this type of pufferfish must crunch on hard things to wear down its teeth. As with other pufferfishes, the Mappa puffer can ingest large amounts of water when threatened. In this way, it can swell to twice its usual size. This is how it avoids being eaten. However, pufferfishes like this species are poisonous. Their livers, ovaries and skin contain tetrodotoxin. That poison is an extremely toxic sodium channel blocker. That blocker affects both the central and peripheral nervous systems. Most importantly, it causes paralysis. The Japanese consider pufferfish meat a delicacy. They call it fugu. Only specially licensed chiefs have permission to prepare the meat. The chief must carefully remove Internal organs and skin prior to consumption. A low dose of tetrodotoxin causes tingling and numbness in the mouth, fingers and toes. Symptoms of a higher dose include nausea, vomiting, difficulty in walking, and paralysis. Most importantly, that paralysis can negatively affect the lungs, leading to respiratory failure. Only one to four milligrams is needed to kill an adult! Tetrodotoxin has no antidote. The treatment required for recovery is artificial breathing. Mild poisoning can resolve itself within a few hours. More severe cases can require several days. This treatment is considered successful since many people make a full recovery. Heart failure is rare. Most importantly, treatment must begin before paralysis reaches the lungs. Like many poisons, this one has medical benefits in controlled doses. New studies indicate that it can relieve pain in cancer patients. As such, it could become an alternative for opiates. Actually, pufferfishes like Arothron mappa are not poisonous themselves. Symbiotic bacteria living inside their tissues produce the poison. 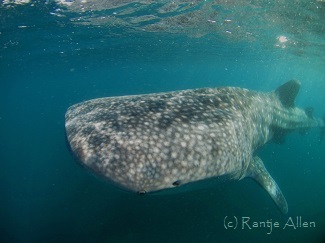 To see but not eat a Mappa puffer in Gorontalo, please book your dive trip with us. 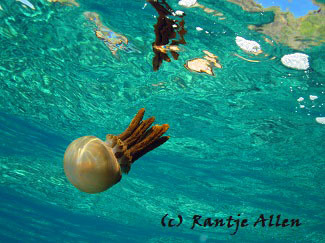 Thysanostoma thysanura is a large jellyfish rarely seen in Gorontalo waters. This large jellyfish lives in warm waters from the central Indo-Pacific to Japan. It was named in 1880. The Latin word thysanura means “bristle tails.” This name refers to the large, bushy oral arms that hang from the jellyfish’s central bell. Modern researchers have gathered specimens from Sulawesi, the northern Philippines and the Great Barrier Reef in Australia. Thysanostoma thysanura has been seen at depths reaching 24 meters. In Gorontalo, however, it has only been observed at the surface. Although Miguel’s Diving has been operating in Gorontalo since 2003, we have only encountered Thysanostoma thysanura a few times. After a dive in April 2015, one was swimming around the dive boat. 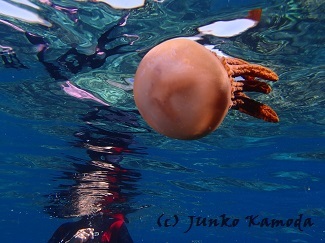 Jellyfish of any kind are usually not present in areas where we dive. Imagine the excitement to see this large and beautiful jellyfish. In our experience, this jellyfish is a very active swimmer. It pumps water with its bell to move. Its oral arms drag along behind it. Taking photographs was a challenge because it never stayed still. Watch our video! Adult jellyfish are called medusa. 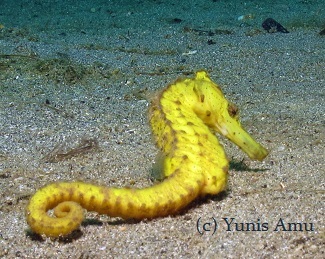 They have a soft body consisting of a bell with tentacles or oral arms surrounding a central mouth. Solitary medusa, like Thysanostoma thysanura, swim freely in the open ocean. Jellyfish are most famous for the stinging cells contained in their tentacles. The stinging cells are called nematocysts. 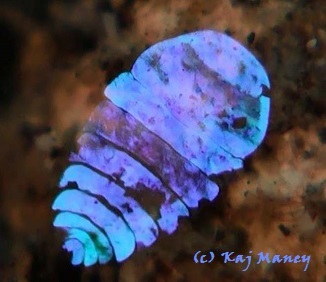 They are microscopic and sensitive to pressure. Even a causal touch triggers hundreds or thousands of nematocysts. They fire like darts. Jellyfish use them to immobilize prey like small fish. Some jellyfish are considered dangerous to humans. We have never seen any of these in Gorontalo. 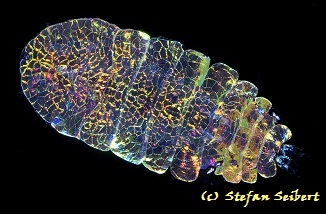 Since Thysanostoma thysanura is so large, avoiding it is quite easy. Since this jellyfish is so rare, only a few lucky divers will ever see it. Our jellyfish was kindly identified by Wyatt Patry of Monterrey Bay Aquarium. Gorontalo’s pristine corals tempt divers to look away from the blue water. Yesterday off the walls divers watched a school of about twenty large snappers and then a school of about 100 Big-eye trevally blasted by us. A Hawksbill turtle sailed slowly away. We have been seeing turtles every day. Then at the beginning of the last dive a pair of Bottle-nose dolphins swam past the divers. Visibility has been over 20 meters lately. Divers spending Lunar New Year with us in Gorontalo dived a cavern, submerged point and muck all in the same day. First was the eerie darkness of Jinn’s Caves, one of Gorontalo’s signature dive sites. Then on the second dive we encountered a 70-kilo Dogtooth tuna not once but twice! It passed so close that no one needed the 30-meter vis to see it. On the final dive of the day a Mimic octopus tried all kinds of shapes and movements to confuse us. We hope to post a video on our Facebook page after guests return home to process what they shot. An auspicious start to the Year of the Dragon!